You are currently browsing the category archive for the ‘russia’ category. On the train to Stockholm. 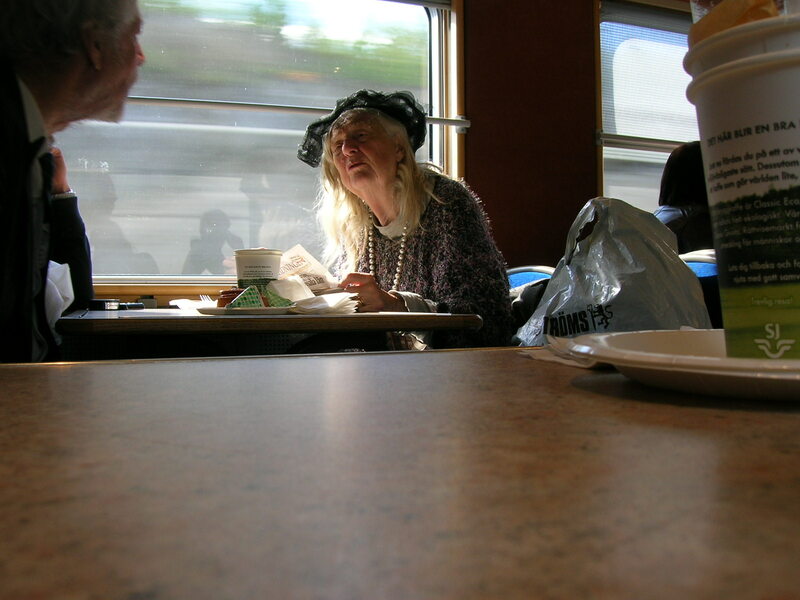 This lady was like something out of a children’s book, and actually she quite resembled a triplet from “The Triplets of Belleville“. The man on the left was her equally eccentric-looking husband. Kostia and “the Russian fil”, fil being a cousin of yogurt. 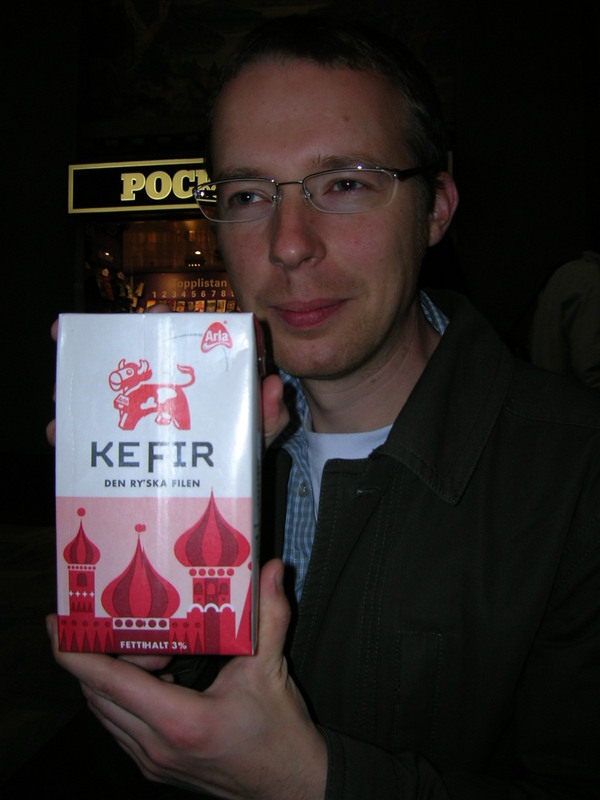 They don’t seem to sell kefir in Falun so Kostia was excited to find it in Stockholm. 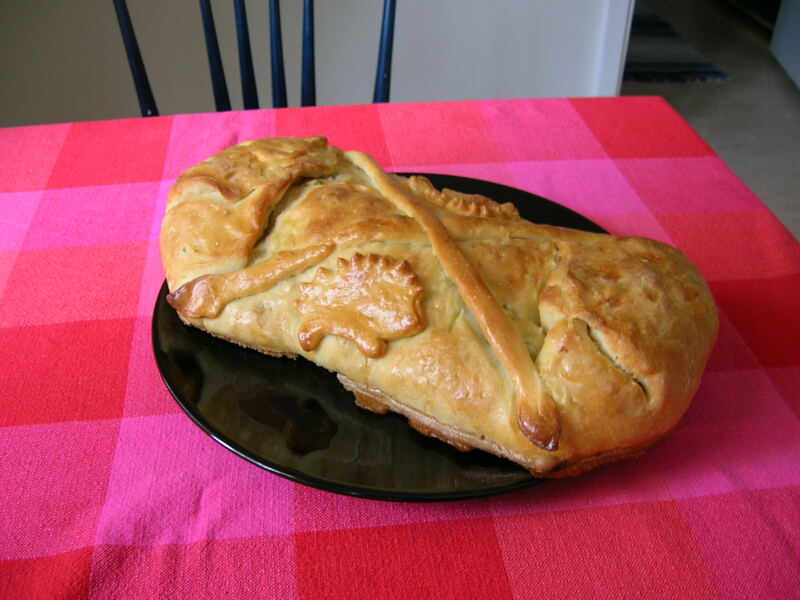 We were invited to a party and instructed to bring a pie, a savory one, not a dessert one, so I looked in my Russian cookbook and made a kulebyaka, which is basically a big pirozhok. This one has meat inside. That’s supposed to be a hedgehog on the side. The decoration leaves something to be desired but hey, it was my first attempt. Babushka Valya died yesterday. Valentina Fyodorovna Baranskaya. She was born in 1922 in the village of Krapivno, in what is currently the Gdov district [in the Pskov region in northwest Russia]. The Polish surname is from her grandfather. He moved to the village in the beginning of the century, apparently. Made the bricks for the local church. Babushka was so proud of her grandpa and her surname that she didn’t take her husband’s name. For this her husband, that is, my grandpa, to the end of his days called her that: Baranskaya. To my shame, I only once managed to record her reminiscences. Here and here [in Russian, obviously] she talks about her brother, the war, her husband, the kolkhoz, and Stalin. Kostia returned from Russia with a funny ad for Nikola brand kvas that he had torn out of a magazine. Kvas is a traditional Russian non-alcoholic beverage which is an acquired taste for foreigners. The Nikola brand often uses ad campaigns that play off its Russianness and other soft drinks’ foreignness – even its name, Nikola, sounds like “not cola”. The new ad campaign is totally over the top. The idea is that there is a foreigner, probably supposed to be an American, posing as a Russian and trying to persuade people that kvas is bad, and the Russian consumer is supposed to find this mock-offensive and want to drink patriotic kvas. The ads are written in pretty amusing Russlish. They have a bunch of video clips at the ad campaign’s website, where you can see that it is a Russian posing as an American posing as a Russian trying to persuade people that kvas is bad in order to make them think that kvas is good. A pretty convoluted strategy. I think only a small number of people are in a position to appreciate this. Judging from the comments on YouTube, most people don’t. The website is full of bizarre content – some geek spent a lot of time putting this ad campaign together. Kostia’s at his family dacha in Russia at the moment, sending me occasional SMS updates on what Russian TV is saying about the South Ossetia conflict. A decidedly different view from the ground in Tbilisi can be found at WuWei. I have no more information on who’s to blame and what’s going on than the BBC or the New York Times do, but my gut tells me that Saakashvili is the lesser of two evils here. Congratulations to the Russian national football team! Kostia and I were on a train for most of the duration of the game. I listened to it on the radio when reception allowed, and Lenka SMSed me the score when it didn’t. It was very exciting. I don’t even know why I care, except that I can imagine exactly what it is like on the streets of St. Petersburg at this moment – full of drunk, happy people, on the whitest of the White Nights. (edit: Oh, and also because it’s fun to root for the underdog.) I kinda wish I was there. Update: Kostia disagrees. He thinks that Russia needs to keep its one bargaining chip in the negotiations for visa-free travel for Russians in Europe. I still think it’s a weak bargaining chip at best and Russia is only hurting itself by discouraging tourism and the money it brings. Yesterday I made poor Kostia watch the film “White Nights” which, as you may know, is not an adaptation of the Dostoyevsky short story, but rather one of the most absurd screenplays in the history of cinema. In a nutshell, a Soviet ballet star who has defected to the US (Mikhail Baryshnikov) is on a plane which crash-lands in the Soviet Union, and the evil Soviets try to keep him there, making an American tap dancer who has defected to the Soviet Union (Gregory Hines) be his guard and companion. I wanted to watch it because it made a big impression on me 20 years ago. It was one of those movies that got steady rotation on HBO for awhile and then disappeared from our lives, and I think it contributed to my fascination with the Soviet Union, and my decision to study Russian in junior high school. It’s always funny to watch a film that you thought was cool when you were a kid, knowing it’s going to be really bad. But now that I’ve spent time in both St. Petersburg and Helsinki it was neat to be able to identify which shots were stock footage of Leningrad and which were actually Helsinki, where they shot the film. They did a pretty good job of making things look real and Russian, except that Baryshnikov’s apartment was way too fancy even for a Soviet ballet star of the time. The non-Russian actors had obviously been well-coached on their Russian – although they spoke with accents, their intonation was solid and it was possible to understand what they were saying (unlike, say, Sean Connery in “The Hunt For Red October” who had obviously just interpreted the transliteration in his script for himself. Nobody coaches the Sean Connery, I guess). Also, the dancing was amazing. I can appreciate that now in a way that I couldn’t when I was 11 years old and tap dancing seemed to be the lamest thing on earth. But the plot was still ridiculous, and the soundtrack… whose idea was that soundtrack? I managed to amuse Kostia by singing along to “Say You, Say Me”, though. Why does the brain retain lyrics to terrible 80s songs and not, say, the ability to do calculus? Sigh. The song is from the Soviet sci-fi film “Kin-Dza-Dza”, which a Russian nerd first made me watch 5 years ago. If you grow up in certain parts the US you can get the impression that all Russians are nerds, since many Russians who come to the US are academic immigrants. Once you’ve been to Russia, you realize that Russia has the same ratio of ochkariki/botaniki* to sports fans/pop music fans/rednecks/whatever else as the rest of the world, which is to say, too small. Luckily the brain drain hasn’t drained all the brains out of Russia, and they’re still there, grinding out pirated software and acerbic commentary on their LiveJournals. * “Ochkarik” and “botanik” are the Russian words for nerd/geek. An “ochkarik” is someone who wears “ochki”, glasses. You can figure out “botanik” for yourself.